Nothing says “paleo” like bacon. Am I right? Bacon is a healthy fat for paleo eaters to enjoy, and we all know it’s a pretty enjoyable bite! Bacon can have a place in both savory and sweet dishes, and I’ve got some of each to share with you. This simple recipe involves wrapping chicken and jalapenos in bacon and dashing them with cayenne, sea salt, and black pepper. Could a dish get any more perfect? 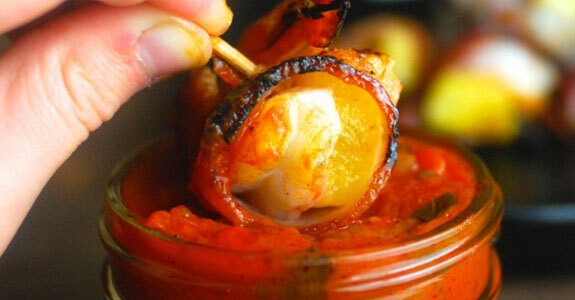 These would make a great snack, or an appetizer for your next gathering. Even non-paleo eaters can’t disagree. This is one of my favorite recipes I’ve ever shared. 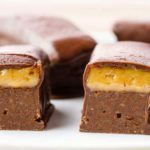 These treats are made with either homemade chocolate hazelnut spread or a store-bought paleo version (Nutella brand isn’t paleo), plenty of bacon and bacon grease, and a cinnamon coconut butter maple-bacon glaze. Yes, this is a pie with a crust made out of bacon. This is NOT a drill. If you’re a pie fan, or if you have a holiday gathering coming up and you want to wow your guests with the deliciously unexpected, you want to give this bacon-crusted pecan pie a try. 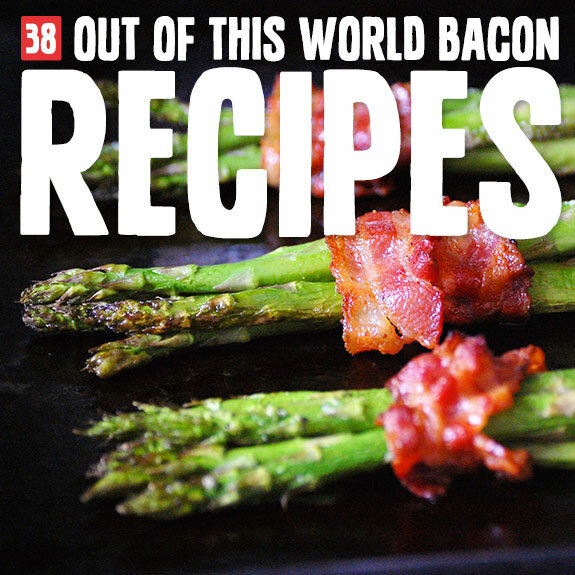 There is no end to the list of things around which bacon can be wrapped (thank goodness) and you’ll see many of them on this list. One such thing is sweet potato wedges, which are wrapped in bacon and baked in the oven until the potato is cooked through and the bacon is brown. Winter squashes like pumpkin and butternut should absolutely be used for their seeds once you’ve eaten the flesh! 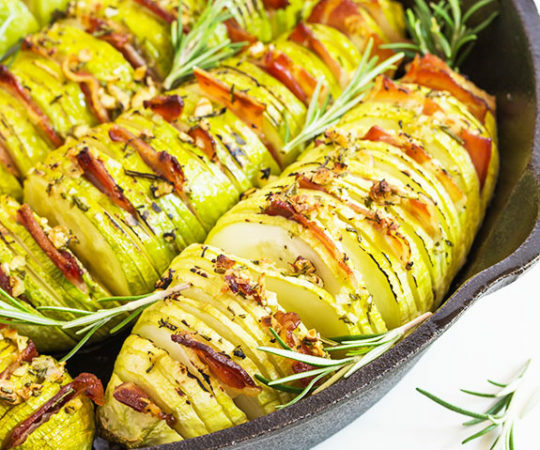 They make a perfect crunchy snack, just like in this bacon-and-squash simple roasted seed dish with dried sage, salt, and pepper. Here’s a simple, one-pot meal to cook up on a busy weeknight (or a weekend when you just want to relax). 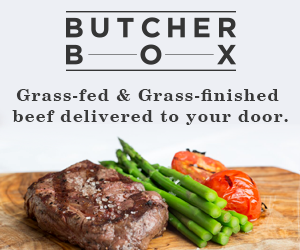 Grass-fed beef and bacon alone with coconut aminos, onion, and paleo-friendly sauce form a delicious barbecue you can stuff between the sides of a potato (sweet or white) or a paleo bun. This isn’t your mom’s meatloaf that you used to wrap in your napkin and sneak to the dog under the table (you know you did it). This meatloaf is made with ground turkey, tomato sauce, coconut aminos, onion, bacon, and mushrooms, for fantastic flavor and a unique layered texture. 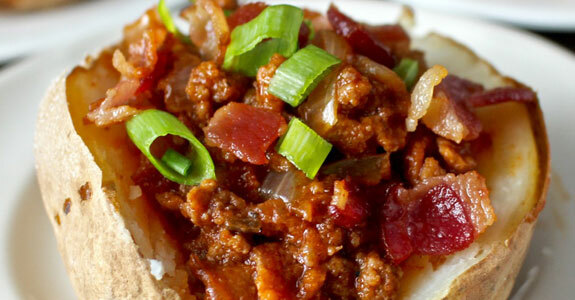 Warning: If you make this, you’re going to want to put it on everything. Well…at least everything edible. I’m serious! How could you not, with ingredients like butter, sweet onion, garlic, balsamic vinegar, and pure maple syrup? This jam is the perfect spread. 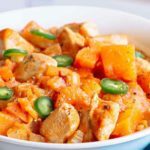 This recipe requires a minor paleo adjustment (use coconut sugar instead of brown sugar) but trust me, it’s worth making. With simple ingredients (bacon, espresso, maple syrup, and coconut sugar) you know it’s going to be a tasty snack, and you should double the recipe and share. 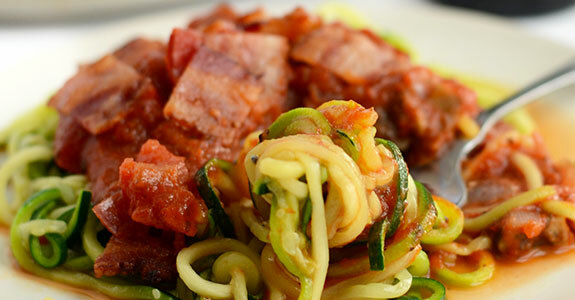 By now, you’ve probably heard of zoodles: zucchini spiralized into noodles. But maybe you haven’t tried it yet with a bacon-marinara. And that has to change. Today. 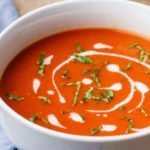 This sauce is delicious with garlic, bacon, tomatoes, mushrooms, and red onion. 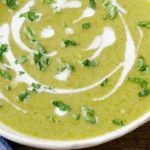 This traditional Italian soup is made paleo with a few twists, and is made with bacon, Italian sausage, potatoes, kale, and coconut cream. 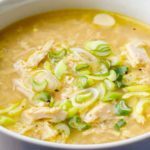 The best part is that you can make this in your slow cooker, so if you throw it all together in the morning, you’ll come home to a steamy soup after work. This has would make a perfect breakfast, lunch, or dinner. 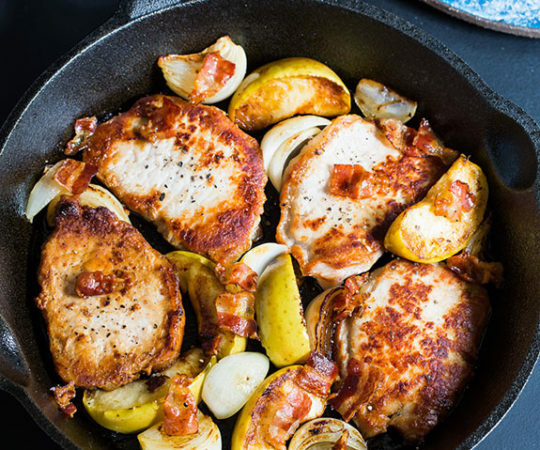 With bacon, chicken, sliced onions, kale, and spaghetti squash, this dish is flavorful enough that it needs only a bit of smoked sea salt for extra seasoning. Don’t believe me? Just give it a try. These little meatloaf bites are made with ground beef and seasoned with black pepper, garlic powder, chili, and other spices. 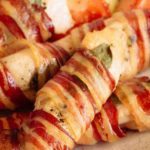 They’re wrapped in strips of bacon, and would make a perfect snack or appetizer for your guests or family—or you could eat them all by yourself. Be still my heart. These are BACON cupcakes with maple syrup and maple extract, made paleo style with almond meal and coconut flour. 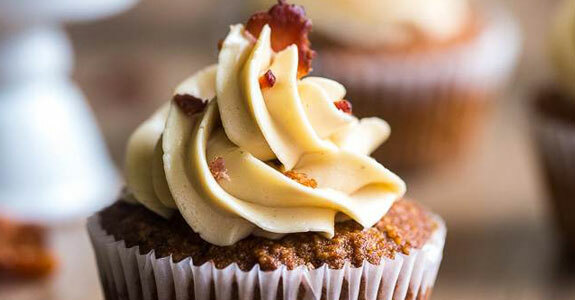 The frosting is a maple bacon buttercream that’s made from butter, maple syrup, and bacon—nothing else. Delicious magic, I tell you. This sweet and salty treat is going right from this page into my mouth. Well, maybe it’ll have to make a pit stop in my kitchen first, so it can, you know, get made. 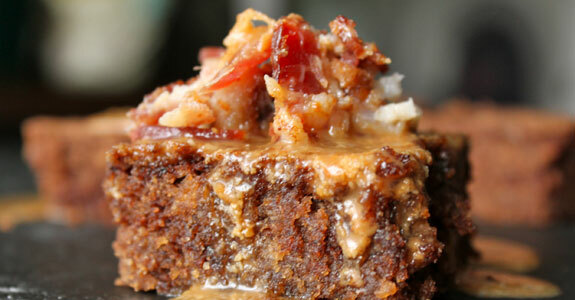 But with chocolate, bacon, and cayenne pecans, why wouldn’t you be making this right now? These guys can pop right on over to my house. Or you can make them, and I can pop on over to yours. So simple (just apples and bacon), so good, and suitable for any day or occasion. If you’d like, you could use Serrano or prosciutto instead of bacon. 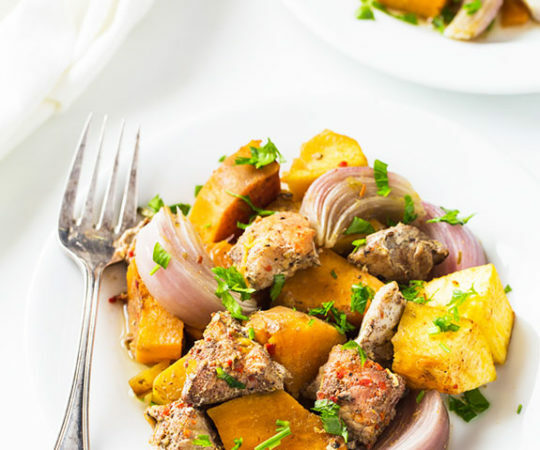 This yummy breakfast (or lunch, or dinner) is made with chopped and cooked sweet potatoes, bell peppers, onion, and garlic, and seasoned with red pepper flakes and rosemary. At the end, it’s piled with crispy fried eggs and delicious bacon for the perfect meal. 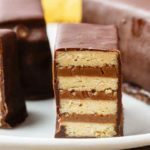 The three things combined in this recipe are some of my favorite treats. These donuts are only gently sweetened with maple syrup and topped with a bacon fat-maple glaze as well as candied bacon “sprinkles.” If there’s not enough bacon in this for you, I give up. These stacks would be perfect for a snack, appetizer, or side dish. Sliced and spiced sweet potatoes are stacked and roasted until crispy with layers of butter in between (yum) and a mapley glaze with chopped bacon sprinkled over the top of them. This is a sophisticated-looking dish that’s delicious and impressive, all without being difficult to make. The flavors of the garlic and bacon blend throughout the potato cakes to make some bacony magic, and the smoked salmon is the perfect pretty topping to pull it all together. These brownies are fudgy and soft, and they’re packed full of candied bacon (recipe included). You could even try replacing the honey with maple syrup (and maybe cutting it back a bit to account for extra sweetness) for a lovely maple-bacon effect. 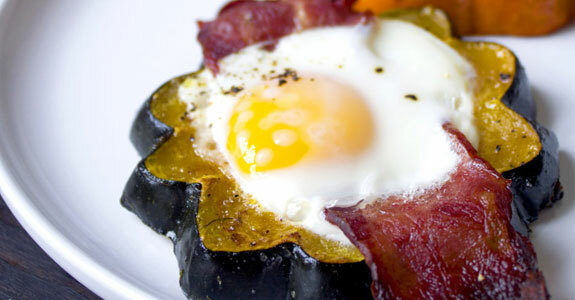 In just a few bites, this beautiful dish is soft and sweet with acorn squash, savory with turkey bacon (or regular bacon), and rich in protein with a single egg per cup. A grass-fed butter-maple glaze finishes everything off and leaves you with the perfect three-in-one breakfast. 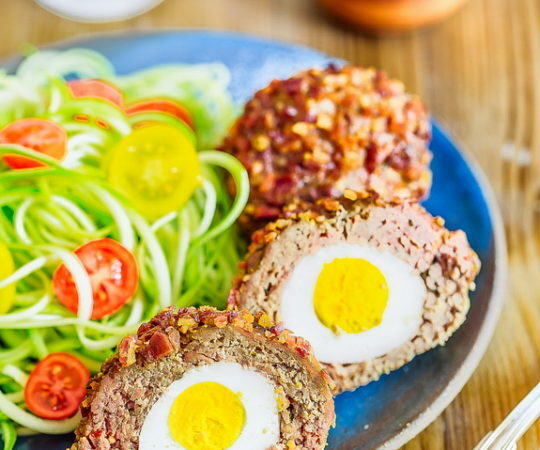 Little bird’s nests made from zucchini (no actual birds involved) are the perfect place for bacon and a cracked egg. 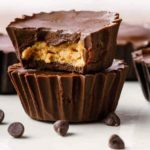 These breakfast cups are so pretty, and would make a great Easter morning breakfast, or a breakfast (or snack) any old time at all. When you’ve got someone you’re trying to impress (even if that someone is yourself, or your meat-loving six-year-old), you make them bacon-wrapped filet mignon. 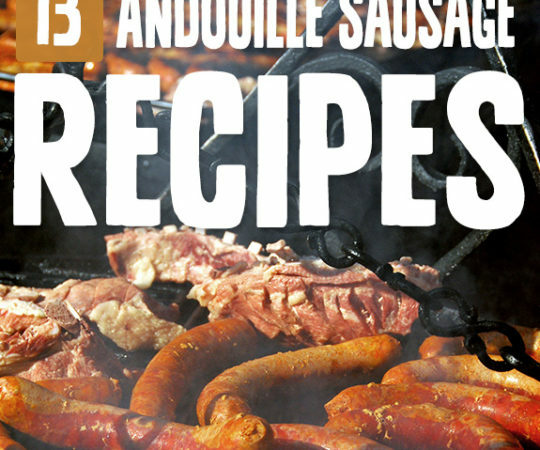 This is a simple recipe with precise instructions on how to get it cooked just right. 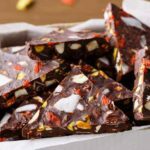 This is an easy way to create something deliciously simple and salty-sweet that everyone will enjoy. You’ll begin by wrapping the carrots in swirls of bacon and then roasting them until golden brown and beautiful, and then you’ll brush them with maple and roast again for a few more minutes. These little buddies get wrapped up tight in a strip of bacon with pineapple inside, and then dipped or slathered in a tomato-basil sauce with sweet onion, oregano, olive oil, and other favorite pizza flavors for a Hawaiian pizza bacon party in your mouth. I have a friend who makes these and brings them around any time more than a few of us get together. And they’re perfect for parties, really. Because if you make an entire batch for yourself, you will eat an entire batch—yourself. These pancakes are perfectly paleo and made with almond flour, coconut flour, and tapioca starch. Bacon fat and ghee are the healthy fat stars of this recipe, but bacon isn’t to be outshined—no, no. With a bit of crispy bacon in every bite, you won’t forget why you made these. According to this blogger, prosciutto is bacon’s older, smarter sister. But if you don’t have any, friend, feel free to just use regular bacon. I do recommend prosciutto, though, as it’s usually extra thin and is a particularly sophisticated alternative. You know macaroons. 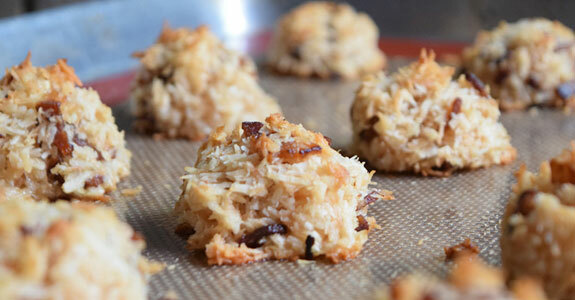 They’re those pillowy little cookies made from shredded coconut and egg whites, and it’s pretty easy to make them paleo because they don’t usually have much flour, if any. 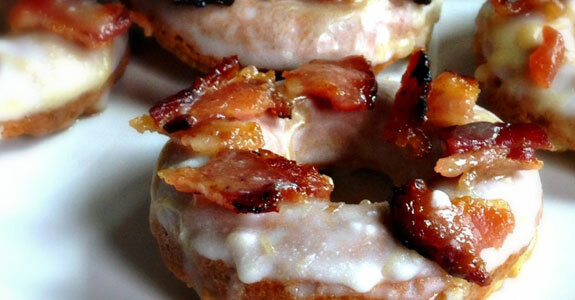 These are sweetened with maple syrup and speckled with spots of delicious bacon. These easy grilled pork medallions are wrapped in juicy and smoky bacon until slightly charred. 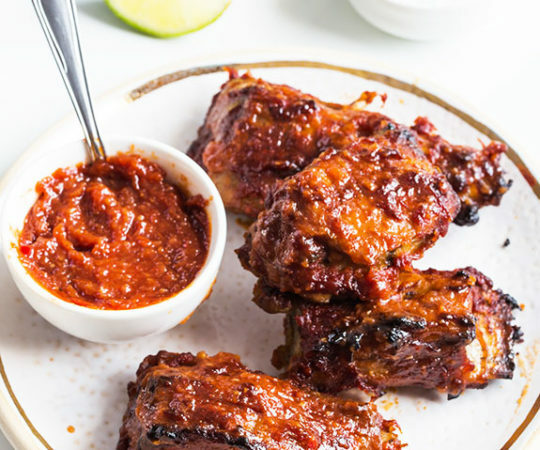 Afterwards, slather them with homemade barbecue sauce (recipe included) and stuff them into your face. Uh, I mean… eat them neatly and take your time. This recipe has all your flavor balances covered for a savory dish: some umami flavors from mushrooms, the slightly sweet saltiness of the bacon, and the green, fresh flavor of Brussels sprouts. They’re roasted, which, in my opinion, is the best way to cook them. These little appetizers or snacks are nicknamed sidesaddle angels because of their shape—a lovely little shrimp with a doubled strip of bacon pinned to its side, the whole thing made even better with coconut cream, tomato, honey, hot sauce, and stone-ground mustard. Oh, you’re traditional about your BLTs? You need bread surrounding that baby? Don’t worry, I’ve got you covered. 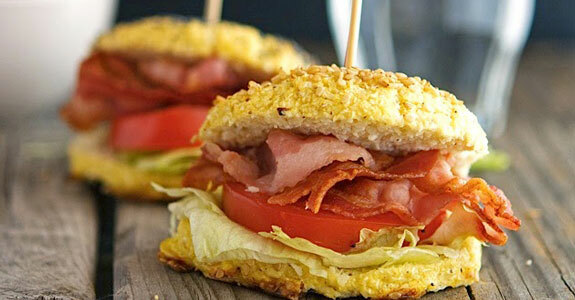 This BLT is on a cauliflower bun with a crispy, crunching sesame or poppy seed top. Make sure you give that homemade paleo mayo a try. Here’s an easy chicken salad you can mix up with avocados, lime, bacon, coriander, pecans, red onion, and shredded chicken. Perfect on paleo chips/crackers, paleo bread, or just with a fork over a bed of tender greens like spinach. Who says you need bread to make a BLT? Not me. These “fillings” look delicious on their own, with romaine lettuce, cherry tomatoes, crumbled bacon, green onion, and a simple white balsamic-garlic vinaigrette for a bonus burst of flavor. This burger is a little bit adventurous. Why? I’m so glad you asked. It’s made with liver! While liver is an extremely nutritious food, many people, even paleo eaters, are a little bit turned off by organ meat. If you need a gateway dish, try this bacon-beef-liver burger. 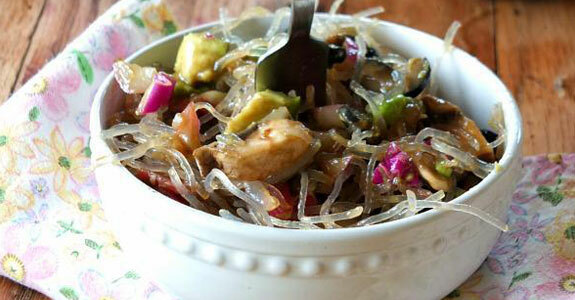 This easy salad is especially beautiful with glassy strands of kelp noodles and flecks of shredded red cabbage. The avocado is cool and refreshing, but we know what you really came for—the slices of bacon (cooked and crumbled) mixed throughout this balsamic-dressed salad. 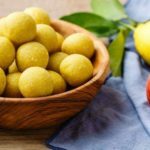 Hi Jess – Thank you for including my Sidesaddle Angels recipe! 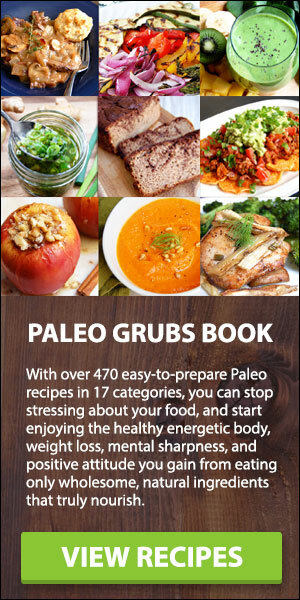 I’ll have to check out these other amazing recipes! !